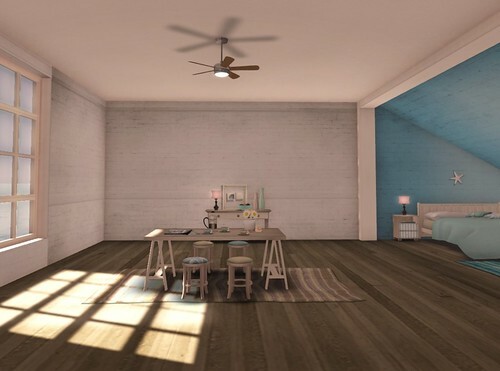 My latest Home & Garden find is this gorgeous new Coastal Loft Skybox from What Next. The skybox is low prim and includes texture changing windows, door panes, and inside walls. I really liked that there are furniture sets made specifically for this skybox so decorating is a breeze! After I’ve rezzed all the decor, the total prim count is about 308 prims, which is very reasonable for a fully furnished space. This skybox spacious and flexible; you can use the decor from What Next or mix-and-match your own pieces. Wow, those shadows look so breathtakingly beautiful!